At the Y we believe the concept that, "Everybody Plays, Everybody Wins!" While we hold this concept true to our core, we also believe that sports programs at the Y teach valuable life lessons on how to compete, win and lose gracefully, and how to work with others building strong teams. This is our mission in the community! There's nothing quite like the feeling of executing a great serve in any of our racquet sports. We offer great sports like racquetball, wallyball, pickleball and table tennis because they are non-traditional sports that are not only good exercise but build fantastic hand-eye coordination, reaction time and fine motor movement. There is strategy involved in these sports also that is sure to keep the mind active. So, stop in and pick up a racquet or paddle! The Y offers three courts for racquetball use. Please call 920.682.0343 to reserve your court time. Pickleball, a sport that resembles tennis and table tennis, played in our gyms and with a wiffle ball. Open Pickle Ball week day mornings and Sunday eventings from 4:30pm until 8:00pm. 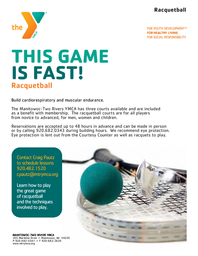 Come play this fun game in one of the racquetball courts which is open to all! Love playing hoops? We do too, don't miss out on keeping the rust off of your game. Join us at the Y, early every weekday morning and weekdays at noon for pick-up basketball. Adults young and old are welcomed to play. If basketball has been a big part of your life, you don't have to let it go. See you on the court! We invented the sport in the late 1800's. Now show off your skills in this fun league.